… imagine a puddle waking up one morning and thinking, “This is an interesting world I find myself in, an interesting hole I find myself in, fits me rather neatly, doesn’t it? In fact it fits me staggeringly well, must have been made to have me in it!” This is such a powerful idea that as the sun rises in the sky and the air heats up and as, gradually, the puddle gets smaller and smaller, it’s still frantically hanging on to the notion that everything’s going to be all right, because this world was meant to have him in it, was built to have him in it; so the moment he disappears catches him rather by surprise. This entry was posted in Photography and tagged Adelaide, architecture, City, colour fx pro, Lightroom, Photography, Puddle, Street Photography. Bookmark the permalink. I really like this one. Beautiful! Great! 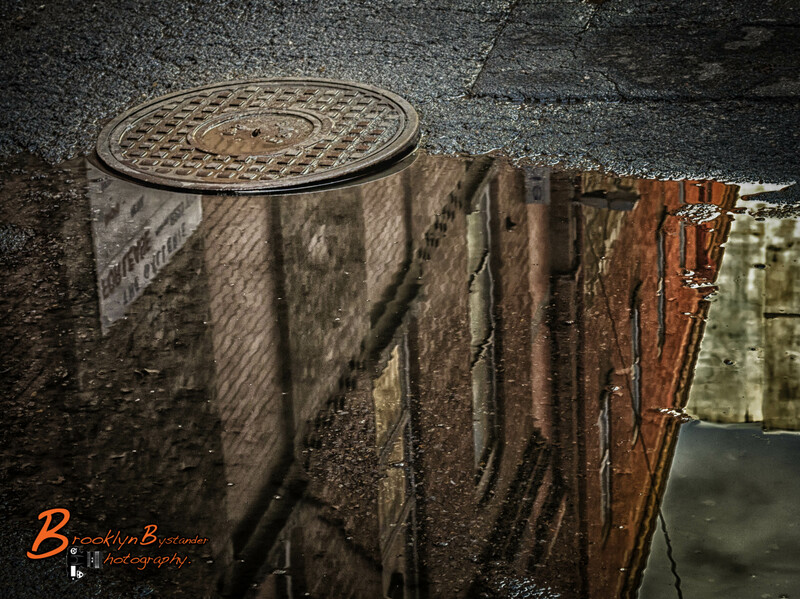 Both, the puddle theory and especially your photography. I really like puddle photography. A puddle can be a magic motive, with an enormous effect. This is an amazing shot and I love puddle reflections. Great reflection and the puddle theory! I have never heard of the puddle theory. I love it! There is a puddle at the end of my driveway (hate it) that I will be much kinder to in thoughts as it disappears unwillingly and unsuspectingly. Your photo is absolutely a perfect way to bring the theory to life. Thank you, Mike. 🙂 Poor, poor puddle. This looks like a secret, inverted world. Lovely shot.